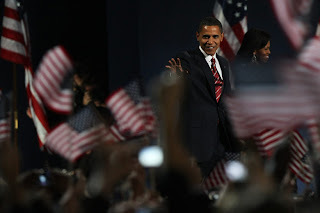 It often gets overused - the saying, "where you were you when..." - but I truly believe that today will be one of those days when we will want to recall and relive the moment when we learnt that Barack Obama was going to be the next president of the United States of America. I was in a corner shop in Bondi. I had locked myself out of the apartment - don't ask! - and was walking the streets for hours with my four-month-old baby until my husband arrived home with his key. The shop had live coverage of the election. It showed that Obama's lead was decisive and I had a lump in my throat and tears well in my eyes. I never thought I'd see the day. I don't think I'm the only person who has become cynical of politics and despondent about the future. But now there is hope. And I've gone from fearing what sort of world my son will inherit to welcoming the possibilities. Barack Obama rocks because he has given us hope on many levels. He's a true inspiration - because of his beliefs, his achievements and his character.